Heat butter in a medium saucepan over medium heat. Add onions and bell peppers and cook, stirring, until soft and lightly golden, about 6 minutes. Add salt, cayenne, black pepper, tomato paste, paprika and 1/2 cup water. Reduce heat to medium-low and cook, stirring often, for 5 minutes. Add cornstarch and water. Cook mixture, stirring often, until it is smooth and slightly thick. Add crawfish and cook, stirring occasionally, for10 minutes. Add green onions and parsley and adjust seasoning to taste. Remove mixture from heat and cool. Spoon mixture into the pre-baked pie shells. Place on a baking sheet and bake at 350°F until the mixture is bubbly, 8 to 10 minutes for small pie shells or 15 to 18 minutes for a 9-inch shell. 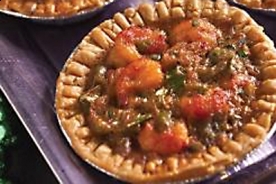 *The filling can be made up to 2 days in advance and stored in an airtight container in the refrigerator. Name of Chef: Marcelle Bienvenu.